I am going to share drawings of simple house landscapes in this post. 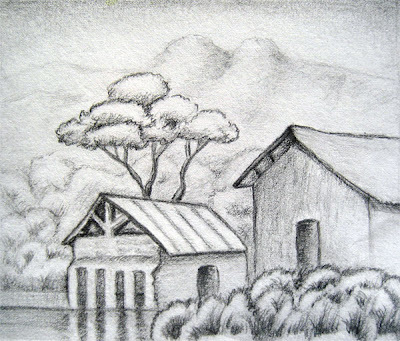 If you are a beginner this page would be perfect to begin drawing house landscapes. 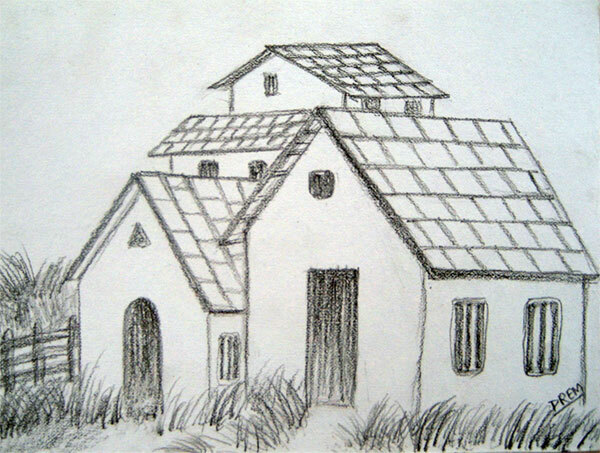 So, be ready with your pencil, perhaps a 2B, 4B or 6B one, and sketchpad to draw different types of houses. This above house is a simple one to get started. It's perfectly fine for beginners. However, for experts eye this isn't pleasing. Why? Because of the straight lines! I'm not yet in the position to comment about the straight lines. However, what I think is that the straight lines ruin the melody of the rugged landscape. In other words, straight line drawing would resemble more of an architect's design of a building rather than the artistic houses of an artist. So, in any way, it would be better to avoid such lines in your future drawings and artworks. 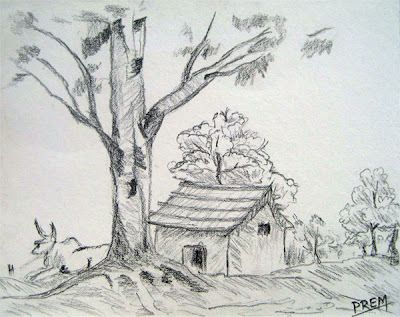 This sketch somehow corrects the mistake made in the first sketch. There aren't many single lines! Even the trees aren't symmetric and have straight lines. So, this sketch is artistically much better than the previous one. Although, this is not excellent, it is not bad either. If you think you can try this, go on! Here the house is a bit small and looks more like a hut. The rugged landscape and the surrounding trees make the house artistic and real. 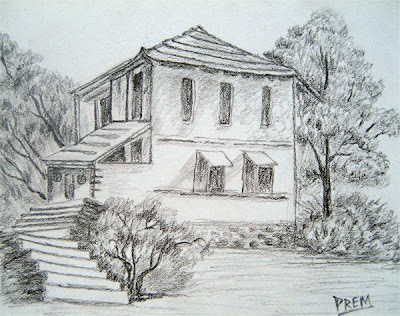 This sketch truly looks like an architect's design, much more so than the first picture with straight lines! 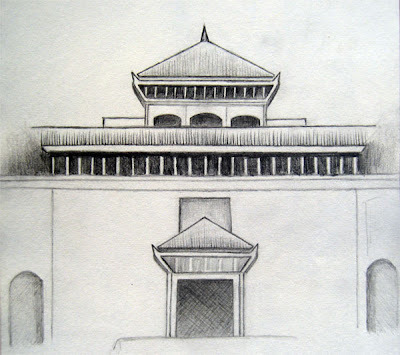 This is the sketch of Birendra International Conference Center (BICC) of Nepal. It's my very old work and it took a lot of time to sketch it in the precise manner as reflected in this image itself. Although, it's not complete, major parts have been covered well. This kind of work isn't recommended in arts perhaps but good for your practice if you are going to become an architect. This landscape is the sketch of Hanuman Dhoka Durbar Square (also known as Kathmandu Durbar Square) situated in Basantapur, Kathmandu. I made this on the spot but very long ago. Perhaps this is my first "on-the-spot" sketch! This is one of my beautiful (although not perfect) work of a rural house landscape. This sketch made me more confident about my own skills. 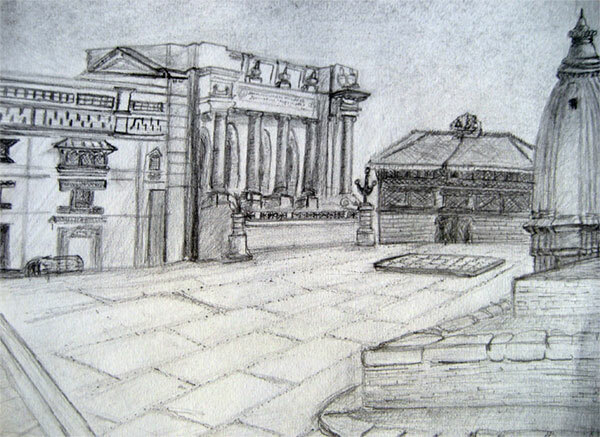 This sketch has quite a few straight lines, if any, and it can be pleasing to the experts as well. Whatever, this simple rural house landscape can be a good practice for you if you are a beginner. I wish you good luck for your practice. 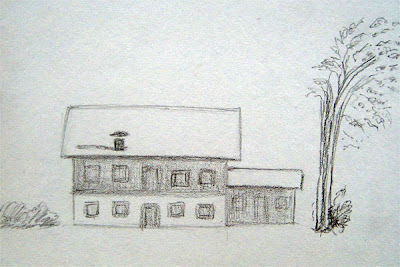 This is a casual drawing of a small house. Good to practice for beginners and useless for experts! Thanks for your feedback! I really appreciate your few words!